…Singing of the traditional Croatian Christmas songs in and of its self teaches and reminds us of the importance of what Jesus brought to us with His incarnation. This year, once again, we held our Christmas concert „Preveliku Radost” for the third year in a row. 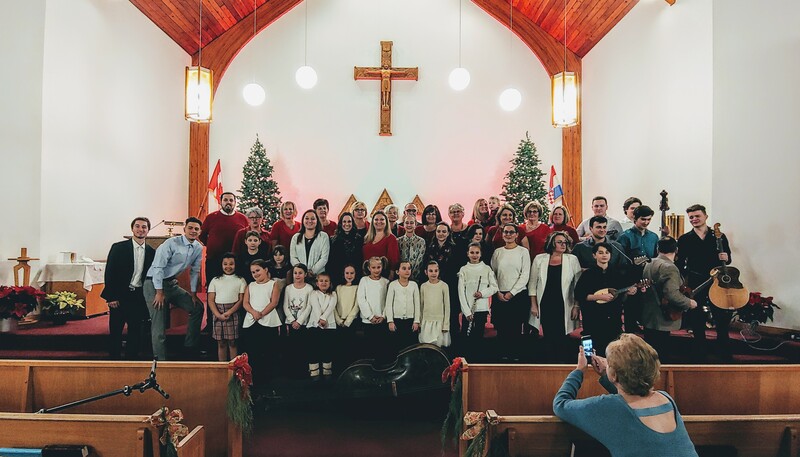 The concert took place on St. Stephen’s day December 26th, 2018 in the evening at St. Nicholas Tavelich Parish. Our youngest performers, the catechism kids, were the first performers of the evening. They captured the hearts of the audience with their performances of Away in a Manger and This Little Light of Mine directed by their teacher Marica. Once again Joanna Gustave Cindrić treated us with delightful singing of traditional English carols. Vesna Šimunić brought us three modified popular songs, one which was accompanied by Martina Knezić singing and Jelena Knezić on flute. David Knezić led the tamburica band in the playing of Adeste Fideles, and for the first time the Hrvatska Zora Christmas carolers performed. The Christmas concert was ended by the Parish choir performing songs accompanied by Joanna Gustave Cindrić on piano and conducted by Father Marko Štefanec our pastor. Following the concert, Father Marko mentioned that singing of the traditional Croatian Christmas songs in and of its self teaches and reminds us of the importance of what Jesus brought to us with His incarnation. Later everyone was invited to the parish hall for fellowship, mulled wine and delicious snacks. Parishioners showed their generosity by bringing non-perishable goods that were donated to Winnipeg Harvest. Our musical talents were once again showcased in this beautiful Christmas concert! How wonderful it is to praise God with our songs!